Head to the Bible Club Tent! 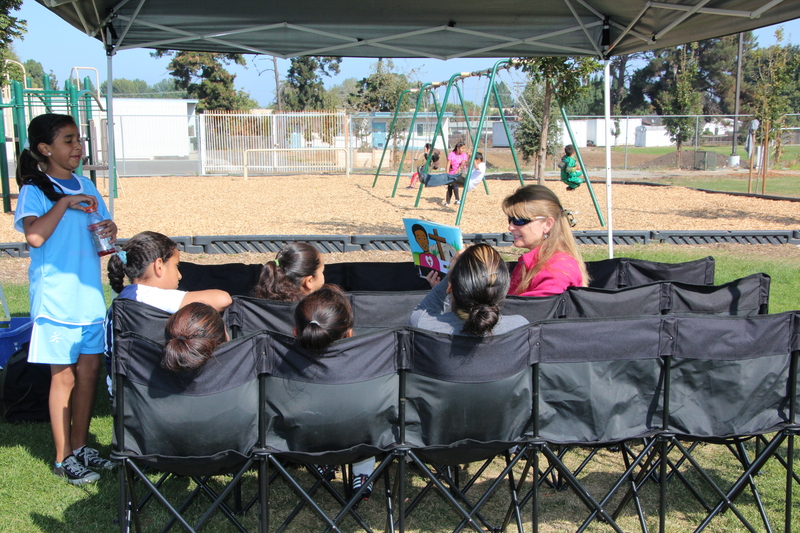 One of RYAA’s main missions has always been community development in the East Palo Alto/ East Menlo Park areas. But it goes farther than just community development, sports and fun. RYAA’s most important mission is to develop kids spiritually. Through Bible teaching and lessons, RYAA looks to expose the community to the Gospel of Jesus Christ. One of the outreach ways is the Bible Club Tent on Saturdays. Kids are encouraged to attend after their respective games, and small Bible lessons are conducted there by volunteers. April Pekary, the wife of Executive Director of RYAA Shannon Pekary, shares with us a few things about her experience as the overseer of the Bible Club Tent. How long have you been living/serving in the EPA community? We have lived in East Palo Alto since we were married in 1991. We’ve raised our 5 children here. When did the Bible Club Tents start? When we started RYAA 7 years ago, we had a vague idea that somehow we wanted to share the gospel with our community using soccer to get their attention. We started a teen girls Bible club that year on Wednesday nights, which still continues today. On the field, we began by just laying out a blanket and having a little bible club after the youngest players’ games. A friend who teaches bible clubs came to help. The following year, we spiffed it up by putting out a canopy with benches for children to sit on. Every year it has gotten bigger and better. What have been some of the hardest/discouraging things about it? Last year, our wonderful, faithful bible club teacher, Debbie, broke her arm badly while playing with the kids. She was unable to return to teach for the season. Meanwhile, I had walking pneumonia. I knew we had to find a way that this ministry can happen without me or Debbie. This year, we have a soccer bible club team consisting of about 10 people. It’s been a wonderful transition. The hardest thing about bible clubs is gathering the children. So many of the parents are in a hurry to get home after their soccer games, and they don’t want to wait another 10 minutes for Bible club. Once the children come to club they seem to really enjoy it, so it’s disappointing when the parents don’t let them come. This can be discouraging, but I’m learning that it is God that draws who needs to be there. What are some of the ways leading the Bible Club Tent has been rewarding/encouraging? Teaching children the good news of Jesus has been awesome!! So many of them are very responsive. So few of them know anything about God’s stories in the Bible. It is amazingly sweet to see the bright-eyed children that are particularly drawn to God and want to sing and learn all they can. How many kids usually attend? We have clubs as small as 2 children and as large as 25 happening throughout the day, mostly as soccer games end. I would estimate 60 or more children attend club each week.